Access to the interior is 3 euros for adults and children are free. The case to get rid of the mess that saw rapid arming permanent exhibition dedicated to the city of Salonica organized by the Museum of Byzantine Culture, which are the rooms that are located along the ramp wrapped spiral steps inside the tower to the top. 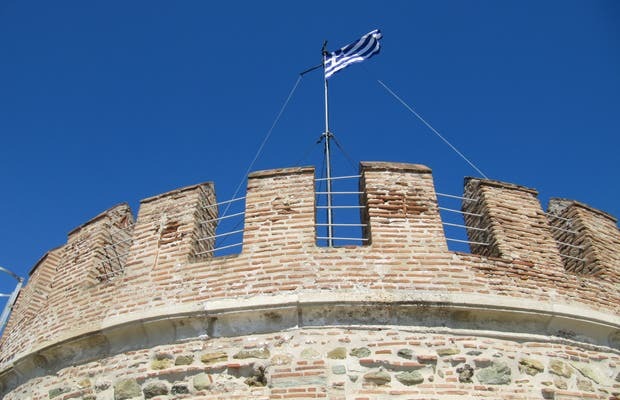 The view is magnificent and under no circumstance will the must lose your visit of Thessaloniki. From the top you see the entire city, the waterfront, the mountains that surround the Heptapirgión control from above. But above all, what struck me most was the ridge of Mount Olympus, snowy peaks under the clear sky on the other side of the bay.